Does your pooch like to feel the wind in her fur? Does she enjoy the open road? Then this cool Biker Dawg Motorcycle Dog Jacket is just for her! The details will make your bad girl feel like one of the gang and maybe even the leader of the pack! This designer faux leather jacket has a high quality embroidered Biker Dawg Vintage motorcycle on the back. There are several high-quality studs that embellish this jacket to make your dog's look just like your own motorcycle jacket. The larger the dog jacket, the more studs it will have. The heavy D-ring enhances the metallic features but is also practical as it transforms this jacket into a harness too. (Leash not included.) For larger breeds, we recommend additional restraint for heavy pullers so there isn't too much pressure placed on the polyurethane material. Heavy duty touch fastener straps adjust at the neck and chest for comfort and durability. 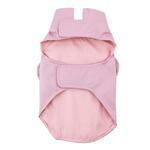 Also features a soft woven liner for comfort and provides a quality finished look. This stylish dog biker jacket is great for dogs headed to Sturgis or just want to look cool locally. Perfect for dogs that ride on motorcycles or just hang with the gang at the local watering holes. Sure to be a hit at the motorcycle shop! Check out the Biker Dawg Motorcycle Dog Jacket in Black. 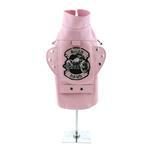 Biker Dawg Motorcycle Dog Jacket by Doggie Design - Pink Customer Photos - Send us your photo! Addie gets the most compliments on this jacket. We are tickled pink with how cute she looks in her Biker Dawg Motorcycle Jacket by Doggie Design. She is so sweet & smart and loves getting dressed up. Posted On 01/05/18 by Arlyn P from Chicago, IL Yes, Arlyn P recommends this product! Addie gets the most compliments of all her outfits on this jacket. We are tickled pink with how cute she looks in her Biker Dawg Motorcycle Jacket by Doggie Design. The Velcro fastens well and the heavy D-ring attachment makes it easy and secure to attach a leash. Posted On 10/01/17 by Sarah L G from ANTIOCH, CA Yes, Sarah L G recommends this product! Such a cute outfit. It would get 5 stars if the material were a little softer. Posted On 08/19/17 by Valarie Janowski from Springfield, VT Yes, Valarie Janowski recommends this product! Love this jacket. It looks adorable on my dog. Posted On 08/13/17 by Deborah M from Saint Petersburg, FL Yes, Deborah M recommends this product! I purchased the black Biker Dawg studded vest jacket for my male cavalier and LOVED it so much when I received it, I had to buy the studded pink leather Biker Dawg vests for my 2 girl cavaliers! Love the quality, design and fit. Sturdy velcro tabs makes adjusting the fit easy. Highly recommend. Posted On 07/12/17 by Pawz Up from , FL Yes, Pawz Up recommends this product! Posted On 05/14/17 by Darrell D from Millsboro, DE Yes, Darrell D recommends this product! Oh to cute. Now she ready to ride in style. Tiffany Love Her Hot Jacket! Oh my goodness this is so darn adorable I was more than surprised when she wouldn't let me take it off for hours. So cute & well made We Love Our Biker Pup! Impressed with BaxterBoo so far. Can't wait to get our stuff! Competitive prices, too!